Louis Caracciolo grew up making wine with his grandfather. Years later, as a global food scientist, he consulted with the French and California wine industries where he worked with brands like Chateau Margaux and Mondavi. So it is fair to say that wine has been a central part of Caracciolo’s existence. In 1976, Caracciolo planted the first vines on his property near Atco, New Jersey. Six years later, he opened Amalthea Cellars to the public. Today, Amalthea has seven acres of estate vines and sources additional fruit to make about 5000 cases of wine annually. There are currently not plans to expand acreage or production. Some of the most popular wines are from the “Europa Series” that emulate the great Bordeaux wines using New Jersey fruit. Sniekis pointed to the “Cabernet Sauvignon Clone II, our Cabernet Franc Reserve, and our Chardonnay Sur Lie” as element of this line. During my visit I was able to taste through a couple of these wines. The Cabernet Sauvignon was big and complex with a long finish. The Europa I blend, however, was a real standout. The 18 to 24 months in oak imparted great structure and firm tannins. It is a wine that can spend many years in the cellar. In addition to the two I mentioned, all of the wines were well crafted. 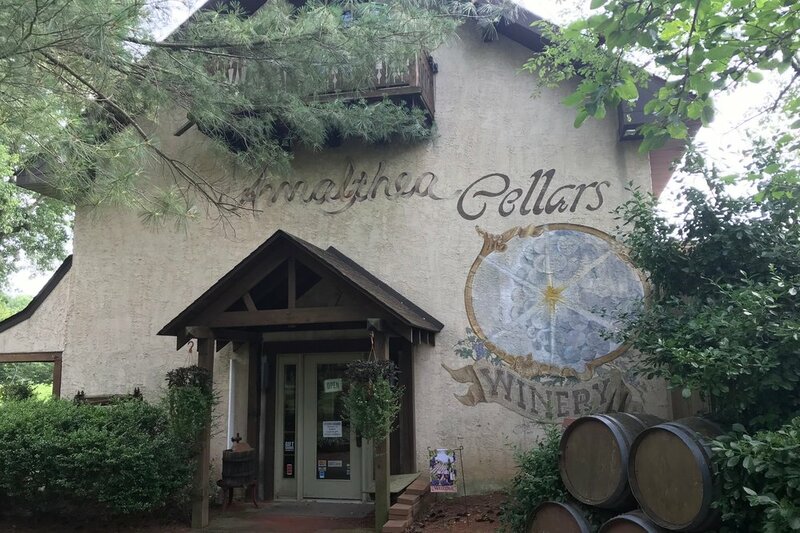 It is fair to say that Amalthea Cellars is an important player locally and compliments the New Jersey wine industry as a solid producer of fine wine. If you have not stopped in, this is a venue worth checking out. After you do, please let me know what you think. This producer is still a relative newcomer to the New Jersey wine scene. Mark Hernandez purchased the property as a retirement project. In 2012 he planted grapes to maintain the land’s farm status. With nine acres under vine, Hernandez started making wine in 2014 and by 2016 Autumn Lake Winery opened for business. Today Hernandez is growing 17 different grape varieties and plans to plant about three more acres on his Williamstown property. This will allow Autumn Lake to expand beyond the current 1100 cases produced annually. Located in the Pine Barrens National Preserve, building permits can be a bit tricky. So much of the operation is conducted outdoors. During warmer months, the tastings are conducted outdoors as well. A permanent tasting room is in the planning stages, but awaits approval. Hernandez was at Autumn Lake when I arrived and took the time to pour a few of his offerings. Despite the fact that winemaking is a new vocation, he is turning out a few wines of very high quality and the entire lineup is trending toward that same level of excellence. The Chambourcin was a distinct wine of note and the one I will focus on for this review. Aged 17 months in American oak, this wine can be described as big and almost jammy with rich berry notes and some earthy qualities. I am not often inclined to speak so highly of this grape variety, but Autumn Lake example is simply over the top. It has the potential to win gold. Despite the “temporary” feel of the Autumn Lake operation, it’s still a worthwhile stop. The wines are showing great promise and the staff is both friendly and enthusiastic. It’s also a lovely spot on the edge of a small lake surrounded by pines. So I encourage you to show this winery some love. Let’s keep an eye on this one and watch as things progress. After you stop in, please let me know what you think. 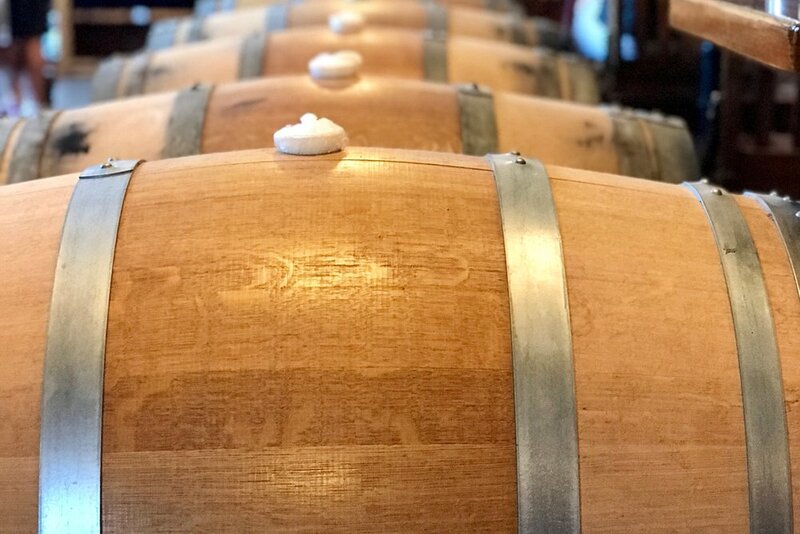 Following a particularly harsh winter, owner Jim Quarella decided to take Bellview Winery near Landisville, New Jersey in a different viticultural direction. In his effort to replace the typical grape varieties with vines that are more cold hearty, Quarella may have inadvertently created one of the most interesting wine programs on the east coast. The Bellview property was a produce farm prior to transitioning to viticulture. The winery opened its doors in 2001 and today has 45 acres under vine. The estate fruit is used to produce about 25 different wines with a total production of between 4500 and 5500 cases annually. The original plan was to grow the same grapes and make wines similar to those made by other regional producers. The harsh winter of 2013 killed enough of the vinifera that Quarella stared looking for alternatives. This is not to say that traditional European varieties are not grown, but there is an ongoing initiative to find satisfactory and more resilient replacements. Grapes like Blau Frankisch, Cabernet Franc, Gruner Veltliner and Viognier grow alongside Traminette, Chambourcin, Cayuga and Regent. Winemaker David Gardener started out working in the vineyard in 2005. Following the departure of Bellview’s previous winemaker, Gardener assumed the role. As lead winemaker, Gardener is working wonders even with grapes that are not typically associated with great wine. I probably tasted a dozen wines during my stop at Bellview. Let me say at the outset, all of the wines were excellent. The Gruner Veltliner and the Blau Frankisch were of extraordinary quality, but I want to talk about some of the “other” wines. Regent is a winter-hearty German hybrid that is gaining popularity, but not often seen in Eastern North America. The Bellview example is very well crafted with nice fruit and chewy tannins. I'm not sure why we don't see more of this grape. Coeur d’ Est, is a blend specific to Southern New Jersey that must contain between 25% and 50% Chambourcin and at least one other approved French variety. This was the first one I tasted and I found it to be very approachable with a bit of complexity and soft tannins. It was very well done. Let me tell you about the biggest surprise. I never thought I would rave about a Cayuga, but Gardener has constructed a dry-style wine from that grape and it is just over the top. Half of the wine saw time in oak, which gave it some structure. There were none of the foxy notes typically associated with Cayuga. Instead, it was a perfectly balanced white wine. To me, it was the standout of the entire tasting. What more can I say? Bellview Winery is just killing it with a lineup that contains many of the “usual suspects” and a few things that are pretty nontraditional. So make an effort to stop in and check this out. If you are exploring New Jersey wine, this producer should be high on your list. After you stop in, I really want to know what you think. First and foremost, Todd Wuerker is a farmer. When he began planting grapes on his family’s Cape May property in 1997, he knew very little about viticulture or winemaking. Nevertheless, Wuerker’s agricultural background provided the tools necessary to excel at the new venture. The single most important element of winemaking is the quality of the fruit. For the first few years Wuerker sold his grapes to other local producers. During this period, he mastered the science of winegrowing. Beginning in 2007, Wuerker started making his own wine. The following year, Hawk Haven Vineyard & Winery opened its doors. Today the 14 acres of estate fruit are used to make approximately 5500 cases of wine annually with a goal of eventually increasing to 10,000 cases. There are 16 different grape varieties grown at Hawk Haven. According to Wuerker, the most popular is the Pinot Grigio, but the best growing are the Chardonnay, Albariño and Cabernet Franc. Based on my own experience, I must say that all the wines are uniformly well crafted and exceptional. Of course there were a couple that really stood out. I thought the Riesling was extraordinary. The pear and guava notes mingled with a bit of citrus in a perfectly balanced wine. My top pick, however, was the Cabernet Franc. This is a variety that does very well in New Jersey and that is also true for the Hawk Haven example. It had nice fruit and complexity with a bit of pepper in the finish. It is a fabulous wine. If you are on Cape May, you should check the Hawk Haven calendar. There are a number of public events like Sangria Sunday or the Rootstock Vineyard Concert Series. Vineyard and winery tours are available daily. Alternately, stop by for lunch and take advantage of the deli and cheese program. Hawk Haven Vineyard & Winery is a top New Jersey producer and should absolutely be on your radar as you explore the wineries of the Garden State. After you stop in, please let me know what you think. Cape May is a narrow strip of Southern New Jersey that extends down toward Delaware. To the east is the Atlantic Ocean and the Delaware Bay defines its western shore. The cape’s sandy loam soil, ocean breezes and cool nights are ideal for viticulture. With this in mind, the original owners began planting grapes in 2002. Initially the fruit was sold to other local wineries, but by 2010 a winery and tasting room were built and Jessie Creek Winery began production under its own label. As of this writing, Jessie Creek has five acres under vine and produces over 1200 cases of wine annually from the five grape varieties grown on the estate. There is some effort to expand acreage, but a suitable site has not been found. Noelle Quirk assumed the lead winemaker role after the previous winemaker moved away from the area. Armed with some practical experience, training received at the Philadelphia Wine School and the help of consultant Louis Caracciolo, Quirk took to her role and began to produce some very impressive wines. When I arrived, Quirk was in the tasting room and stepped me through a few of the Jessie Creek offerings. I found the entire lineup to be worthy of praise, but there were a few standouts. Now, Pinot Grigio is often a sort of crowd pleaser and, in my experience, seldom worthy of mention. We tasted a barrel sample of one that was absolutely superb. Extended maceration provided a level of complexity without disturbing the balance. Simply put, it was one of the most memorable examples of that variety I have tasted. We also tried a very solid Merlot and I also want to mention the Port-style offering, but the Chambourcin was just off the charts. I will say that Chambourcin does exceedingly well in Southern New Jersey, so the Jessie Creek example was no exception. It was a big, ruby red, fruit-driven wine with potential for aging. Jessie Creek Winery is still pretty young, but it is beginning to stand out in a part of New Jersey that is fairly saturated with great producers. I suspect that the winery will continue to evolve, but that is one of the exciting things about this producer. So stop in. I strongly recommend a visit and, after you do, let me know what you think. The Cape May Peninsula contains perhaps the highest density of wineries in New Jersey. This cluster of producers also happens to be almost uniformly making quality wine. One member of that group is Natali Vineyards. In 2000, Alfred Natali purchase property that was formerly used as a horse farm with an eye toward making wine as a retirement project. Since then, Natali has planted nine of his 22 acres in grapes and has been incrementally planting additional vines. Today that estate fruit produces about 2000 cases annually. Natali engaged in a process of self-study. More formal education involved courses from U.C. Davis and Cornell. Workshops at Virginia Tech, Rutgers and Penn State further prepared him for his new craft. Subsequently, Natali harvested his first commercial grapes in 2004 and opened his tasting room three years later. Natali Vineyards has since become known as producers of quality dry-style wines and has earned hundreds of medals in competition. During my most recent visit, I tasted through about ten of the Natali and gained a good sense of the wine program. Real standouts among the whites included the Sauvignon Blanc and Albariño. Both were well-balanced, food-friendly wines. There was also a very solid rosé. The Dolcetto was the most impressive red wine with its firm tannins and bright fruit. There is also a line of wines that is made in response to customer demand. Local fruit and berries are pressed and fermented. There is a pair of interesting additions to that lineup. Natali is one of the only wineries on the east coast to use aronia berries, which are known as a great source of antioxidants. The local beach plum is also processed and bottled. Natali is likely the only producer of beach plum wine. If you are down on Cape May, Natali Vineyards should be one of your stops. It is a fun little winery producing some excellent grape wines and a few others that you simply can’t find elsewhere. So after you visit, please let me know what you think. The goal of owner/winemaker Ollie Tomsello is to create a venue where the customers are treated like family. Tomesello is also committed to crafting high-quality artisan wines exclusively from estate fruit. It is fair to say that he has succeeded on both counts. Plagido’s Winery is located in Southern New Jersey near the town of Hammonton. Planting of the 15 acres of grapes began in 1999. Ten varieties are harvested annually to produce the Plagido’s lineup. I counted a total of 20 wines that range from dry to sweet. When I walked in to the tasting room, Alex was behind the bar. She had been with Plagido’s for about a year. Alex was knowledgeable and extremely focused on customer experience. I sampled ten dry-style wines and I will say that they were all well made. Most were made from vinifera (European varieties), but I did taste a nice Cayuga, a Chambourcin and a particularly good Couer d’Est, which is a Chambourcin-based blend specific to Southern New Jersey. I thought the real standout of the tasting was the Cabernet Franc. This medium-bodied, dry-style red was complex with vanilla notes mingling with the fruit and a nice long finish. Cab Franc does very well in the Garden State and the Plagido’s example was no exception. If you are exploring the wines and wineries of New Jersey, Plagido’s Winery should certainly be on your list. After you stop in, please let me know what you think. The 34-acres near Hammonton, New Jersey was an apple orchard until the Sharrott Family purchased the property in 2003. By 2005 the land was cleared and its agricultural purpose gradually shifted to viticulture. By 2007, Sharrott Winery was harvesting its first vintage. The following year a temporary tasting room opened, but there was more to come. As of this writing, Sharrott had just opened a new, very spacious and modern tasting room. With nine acres of estate vines, another twelve leased acres and additional fruit sourced from Southern New Jersey and New York; they are bottling about 8000 cases of wine annually. Future plans include planting another 12 to 15 acres and increasing production to as much as 15,000 cases. According to owner Larry Sharrott, Jr., his winery is part of a new wave of producers dedicated to making quality New Jersey wine. My own experience with the wines confirmed this. I found everything on the tasting menu to be uniformly well crafted. Of course, I had a few favorites. Right out the gate, the unoaked Chardonnay was a standout with its crisp green apple and pear notes that ended in a splash of bright acidity. The medium-bodied Cabernet Franc was also pretty special. Its red fruit and integrated tannins provided an excellent example of a variety that does especially well in the Garden State. My top pick was the Coeur d’ Est blend, which is a specialty of Southern New Jersey. This 50/50 blend of Chambourcin and Cab Franc was big and complex with structured tannins and long finish. To complement the wines, Sharrott has a substantial food program. A menu of cheeses, flat bread pizzas, small plates and salads is available on request and the staff can recommend favorite pairings. Check the website for one of the many public events. These include music, trivia nights and even a book club. Locals make up the majority of the tasting room patrons, but anyone can participate. Sharrott Winery is one of the state’s top producers, but offers patrons much more than great wine. I am a fan and strongly urge you to make this one of your stops as you explore the wines of New Jersey. After you stop in, please let me know what you think.